Every now and then a writer needs to take time to fill up the well. I'm going to take December and plan to visit this very well. Thanks to cleber for use of this image Zen Garden - Ryoanji under Creative Commons. This year on Future of Long Form (FLF) I’ve had the pleasure of interviewing over 20 different experts. Across 21,000 words in 2013 (include 2012 and it's over 42,000!). I’ve written and researched on the challenges and practicalities of publishing and promoting long form non-fiction. And I’ve shared with you some of the pitfalls in the process (both directly and indirectly!). I’ve loved writing FLF but I’m going to take a break for the month of December. I shall return in the New Year with my ideas-well entirely filled up. If you’ve enjoyed my posts here, you might also like the posts for my 2013 column on Books and Writing on Killings (Kill your darling’s blog). All the best of the season to you and yours! May your holiday research and writing go swimmingly. Vertical marketing is about publishers and writers communicating directly to their readers. Thanks to Ed Yourdon for use of this image Web 2.0 conference/San Francisco, Nov 2008 - 08 under Creative Commons. There is a lot of noise in social media and this is one of the challenges says Treasure. But it can be overcome. ‘It’s about being authentic, about showing personality, seeing through all of the boring chatter and engaging your readers in a space where they already are,’ she says. Publishers should also take care to include and train their writers . ‘No matter how much the market fragments it’s going to be hard for a publisher to have as loyal a following as an author or a writer,’ says Treasure. While social media is one of the major tools for vertical marketing it isn’t the only one. Treasure notes a good example of offline vertical marketing in 2013 newcomer Tincture Journal. It placed promotional stickers on street crossings in Darlinghurst (Sydney). ‘They’re right where you’re going to press the button – so you can’t fail to see them,’ Treasure says. In this respect vertical marketing is nothing new. ‘It’s marketing that has been going on for 20 or 30 years… marketing that you would see for rock or pop gigs (except that now we’re bringing it to books and literature),’ she says. Anne Treasure will chair the panel Vertical Marketing (with panelists Kate Cuthbert [Escape Publishing] and Mark Robinson [Exisle Publishing] at this week’s Independent Publishing Conference. Treasure's session will be held 10.15am on Friday 15 November. There was a time some years ago when I burned with annoyance when, upon opening a library book, I would discover that a previous reader – or readers – had marked up all of the salient points, underlining key words and phrases with scribbles in pen. Little did I know that I was experiencing ‘social reading’ in one of its earliest forms. Travis Alber and Aaron Miller describe social reading as, ‘the act of reading while connected to other people, or the philosophy of reading as a connected activity, not an isolated one.’ It’s a subject Charlotte Harper (Editia) will be covering in the paper she’s presenting to next week’s Independent Publishing Conference (titled Social Reading, Long form Journalism and the Connected Ebook). I confess that my early ‘social reading’ in the library made me feel frustrated. The mark-ups denied me my earnest pursuit to form my own conclusions, to find the salient points on my own merit, and to have an unencumbered ‘first read’. Yet recently I was drawn to a library book for research and on taking the tome from the shelf I discovered that my old foe (underlined texts and comments in the margin) had become a friend. The underliner had done me a service – enabling me to more efficiently establish the relevance of the book to my research. Enable social reading on a Kindle to see what others have highlighted and commented on. Electronic publishing has taken social reading to a far deeper level than the (often anonymous) scribblings in the margins of a book. Readers can now use their devices (such as Kindles, Kobos or apps like Readmill) to share and read in-book annotations with everyone else (functions that can thankfully be turned on or off). The geographical breadth of this electronic exchange encourages a wide spectrum of social reading perspectives. Damien Walter, writing for the Guardian, sees the benefits of social reading in a longitudinal context, ‘[I]magine reading a book published in 2013 in the year 2063. In the 50 years between now and then, dozens of critical texts, hundreds of articles, thousands of reviews and hundreds of thousands of comments will have been made on the text.’ Harper says that social reading extends to discussions about texts on social media and sites like Goodreads. ‘The readers’ discussions can form part of the book and enhance it that way,’ she says. Harper agrees that when it comes to in-book annotations social reading can interrupt the flow and give spoilers – but social reading in the electronic space is particularly salient to non-fiction, she says. ‘[Readers get engaged and want] to continue the conversation about stories that don’t end… When they’re reading a work of non-fiction on a topic that they’re passionate about (or intrigued by) they’ll want to know what happened next – how the story continues.’ Social reading doesn’t just benefit and engage readers says Harper, it can also help writers and publishers. ‘Some of the conversations that have taken place around the book can be taken into consideration or can inspire content for new editions,’ she says. As well as the social reading elements Harper sees great potential for long form non-fiction in the electronic realm. She cites commentators like J Max Robbins, who recently wrote that, ‘E-book singles – non-fiction and fiction pieces between 5,000 and 30,000 words – are on the cusp of becoming a significant business and may well propel a renaissance in deep-dive journalism.’ Harper also points to the success story of Long Play, a Finnish publisher of long form non-fiction e-singles that is close to making a profit within a year of its launch. Along with perspectives on social reading, Harper hopes to provide attendees at next week’s conference with some insight into the burgeoning market for long form journalism in e-book format. She’ll cover the impact of recent events (like the acquisition of Goodreads by Amazon) and likely developments for the book industry and journalists. Harper sees a healthy future for long form non-fiction in electronic format. ‘There are more and more publishers specialising in long form non-fiction. As the number of publishers specialising and the number of books grows, then readers will become more aware of the genre and become used to factoring it into their purchasing patterns,’ she says. Charlotte Harper will present as part of the Authors, Genre and Publishing session (1.15pm, Thursday 14 November) at the Independent Publishing Conference. Melbourne’s Emerging Writers’ Festival may be over for another year, but I’m going to sustain myself with some writing-protein with these choice cuts. They’re my favourite words of advice from the established writers who presented at Seven Enviable Lines. These are paraphrased and comments from me are in brackets: Melinda Harvey: There is no such thing as 'made it' when it comes to writing. The blank page always waits. 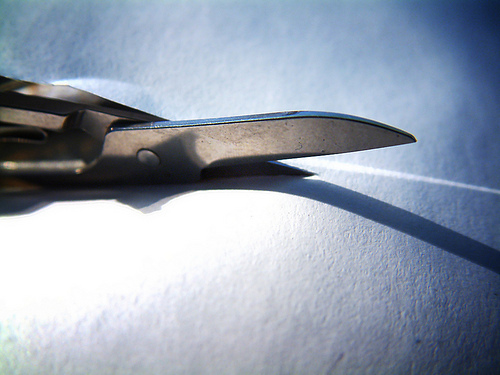 Thanks to Cyril Bosselut for use of this image Scissors vs Paper under Creative Commons. John Safran: Churn out ideas. (As a copywriter Safran had to generate a page of 30 ideas before he was allowed to pitch at creative meetings). Stop being in love with that one idea. Also don’t micromanage a killer idea; just keep writing. Kharani 'Okka' Baroka: Work for the heart, not for the hype. Jennifer Mills: You’re not a brand; you’re a person. Challenge yourself creatively and technically. ‘Let your work be worth something that is more than the cover price.’ (I loved hearing Mills tell us we’re not a brand – so often emerging writers are implored to ‘build a platform’ aka a brand). Walter Mason: Become a fan of writers and books. Be enthusiastic about literature and writing. (Plus:) Run, don’t walk! Use up every bit of enthusiasm you have. Enthusiasm and a sense of time passing can take you a long way. Exercises regularly, underweight (although not malnourished), says appetite is healthy (but cites challenges in consuming more food due to financial difficulties), non-smoker, occasional-drinker. Patient (Long Form Non Fiction) reports high levels of anxiety over past 12 months. No related family history, however significant changes in home environment has created disruption. During past year patient’s parents (Print Newspaper and Print Magazine) were placed in high-level nursing care as a result of ongoing confusion. Patient finds some relief to anxiety by ignoring advice from parents. For example, patient often pursues digital publishing opportunities and has found many new readers. However patient also reports difficulties in being heard online. Claims frequent loss of voice (no physical evidence of dysphonia present). Query: Hypochondria? Patient is not vaccinated. Potential vaccinations were discussed, however it is difficult to know what may be appropriate. Despite lack of immunisation, patient has displayed strong constitution by enduring known super-viruses Newspaperous Demisus (still circulating within the community) and all-but-eliminated Nobodis Wantus Readus Online. Initial impression is that patient looks haggard. Signs of financial difficulties and anxiety are evident (eg clothing worn-out, hair unkempt, avoids direct eye-contact). Yet patient can stand and walk confidently. Close inspection shows that eyes are bright, nose clear and colour is in the skin. No signs of memory impairment or mental slowing. Patient complains of palpitations. Examination fails to confirm this. Overall consultation indicates that patient’s mood can oscillate between a positive and highly negative outlook of the future. These swings (and anxiety inherent in them) could explain arrhythmia. Patient is balanced with strong muscle but displays poor reflexes. Slow to kick when tapped on the knee by new media. (Objects strongly to this test. Claims parents were never subjected to it). Psychologically patient has endured a challenging year with significant changes in home environment including move of parents into a nursing home. Patient is also struggling financially and is uncertain as to how to improve income. Reflexes in relation to new media are a moderate concern and need to be monitored. A positive step is the patient’s commitment to pursuing paths that differ from those of parents. Despite complaints of arrhythmia and underfed appearance the patient’s overall health is good. It’s anticipated that ongoing evolution of technology will ensure improvements in 2013. Improve reflexes through practice (engage more actively in new media). Improve anxiety by respecting the significant differences in the patient’s living environment and that of parents. Actively pursue independence from parental influences. (A psychologist may assist with this). Find new ways to earn income in order to improve weight gain. Next health check scheduled for December 2013. Happy holidays everyone! Thanks for reading this year and all the best to you for 2013. Future of long form will be taking a break and will return with more serious posts from 16 January, 2013. I have two TVs in my garage. They sit near the door, one covered in an old blue and white striped sheet. They’ve been there on two years now. A thick lick of dust has formed on the sheet. Every time I open the garage door – just after I feel its cool air on my cheeks – I see them wide, heavy and useless. Their cathode-ray shapes form techno-carcasses on the concrete floor. All they need is electricity to come to life again. But I know that won’t happen. Sometime soon I’ll have to find the strength to get them into the car. They’ll be at the tip before the year is out. Those TVs came to me less than a decade ago – and not without a little domestic fanfare. One was bought new, the other a second-hand bargain I couldn’t refuse. They both have ginormous screens which I sat before daily in darkness. The shadows of hundreds of stories were cast in colour on the walls of their rooms. Then one day those TVs found their way to the garage. When I bought them I didn’t realise that it was possible for technology to change our habits so quickly. Now I don’t even have the need for a TV anymore. As a medium for storytelling those TVs have seen their last days. Today it seems twee. Thirty years? Try three. Three years is all it’s taken me. The way I consume media over that period has changed so significantly that I now have a phobia about acquiring new hardware. New hardware that is: I’m still interested in stories. In Australia we’ve just had another washout of journalists from our leading dailies, causing more prognostications on the so-called ‘questionable’ future of long form. ‘Long form is dead in this country,’ I heard a journalist recently say. To me that’s the same as saying that because my old TVs are now in the garage there’s no point in Aaron Sorkin ever putting pen to paper. True: the traditional formats for delivering long form to readers are fading. False: there will be no more long form. As Staff Writer for The New Yorker, David Grann recently said, stories are things that are, ‘in some ways wired into our DNA… People have been telling stories for centuries and centuries… It’s always [been] a part of our culture.’ The desire to read and write stories isn’t changing. Only the formats for delivery are. Business models for delivering written work are in flux – but that doesn’t mean they won’t find equilibrium. Many print media organisations have been slow (if not resistant) to digital evolution. Part of that grogginess is a notion that everything in digital format has to be short – ‘for snackers’ as Executive Editor of ‘The New York Times’ Jill Abramson said in this conference presentation. This idea that focus and interest are lacking in readers of digital content is a misnomer. Abramson, for example says that ‘The Times’’ long form pieces are among the most popular on their site. So why is it that so many feel that reading content digitally requires a different state of mind to reading it in print? With a virtual inferiority complex, the early days of the Internet celebrated things that the printed page couldn’t offer. Hyperlinks, sound and animated gifs were cool while plain words were not. Circular storytelling was engaging but linear narratives were droll. Of those who had access, most were excited by the technology – yet uncertain of its future applications. It took visionaries like Steve Jobs to show us what was possible. But they didn’t have all of the answers. In 2008 Jobs added fuel to the virtual end-of-long-form fire, ‘It doesn’t matter how good or bad the product is, the fact is that people don’t read anymore,’ he said. People do read, but where they get their reading from is changing. Our dailies are fast becoming anemic of good in depth and investigative content. I will miss reading them with a pot of tea in a comfy chair on the weekends. But I won’t go without those stories. I will find them somehow. Eliot’s poem continues to describe loss and melancholy – a sense of things that might-be or once-were. He was of course writing on far deeper issues than I am now. But there’s a melancholy he expresses in 'East Coker' that is infused with what I feel about the demise of print media. Something I value is ailing and I want to somehow nurture it to health. Yet at the same time a part of me wants to put it out of its misery, to euthanise print media, so that digital can show us what it’s got. Eliot concludes his poem, ‘In my end is my beginning.’ For a little while now words have been moving from the printed to the digital space. I wonder – if we can eventually get past our ‘grief’ – would the complete absence of print media give us a new beginning? I think it would. I think it would show us that though the business models for delivering long form are changing, the form will continue to exist. Long form hasn’t been killed by digital media anymore than screen culture has by the fact that my old TVs are now in the garage. As an official ‘Emerging Blogger’ for MWF 2012 I have trawled through the festival program as I do every year, ticking, crossing (and doing a twirly line to indicate uncertainty). To do it thoroughly is an uber time-consuming task. So I thought I’d share my shortlist of events with a non-fiction focus. Make sure you confirm the details on the MWF site (titles are linked to the relevant pages). You can also access these pages using the 'MWF Guide' link in the top navigation. A=Arts, AUS=Australia, E=Ethics, FE=Finance / Economy F=Might include fiction (oh no! ;-)), FC=Foreign Correspondent / Travel Writing, J=Journalism, LF=Long form, P=Politics, R=Religion, S=Sustainability / Environment, Sc=Science. Last weekend I wandered the muted rooms of Hobart’s Museum of Old and New Art (MONA). Well, I say ‘Hobart’s’ because it’s located in the outskirts of the city. But technically it’s not Hobart’s. It’s David Walsh’s. He’s the one who conceptualised and funded it. He’s the one who gathered experts to work with him in designing and curating the spaces. It’s both a creative and a business endeavour – a kind of entrepreneurialism that should inspire us as writers. I haven’t giggled, blushed or been forced to question things so often in a gallery as at MONA. What Walsh achieves in this space simply couldn’t be matched by a Government-funded museum. There’s – well – funding for a start, but that’s not all that makes MONA able to achieve more than the older institutions. The gallery’s financial independence gives it curatorial independence. There are recently cremated human remains [Julia deVille’s Cinerarium. There are a lot of girl-bits and boy-bits. There’s a toilet where you can watch yourself defecate [Getlin’s Locus Focus]. And there’s a poop-machine which gets fed real food, digests it and poops its on a round glass tray [Wim Delvoye’s Cloaca]. There’s even a bar inside the space – sanctioning drinking well beyond the opening-night party. Seldom can all of these coexist in a gallery space funded on traditional models. It’s not that the major institutions aren’t trying – they are. But decades of respect to convention can but form crustacean-like blinkers. Walsh has shown what can happen when we think from outside the box (or the book / newsroom as the case may be for us). If I may compare a giant to our humble emerging-writer endeavours: MONA is to museums what ‘entrepreneurial journalism’ is to writing. It’s an opportunity to leverage the great things about a medium, and give it a zing that institutions simply can’t endorse. It permits a creative freedom. I confess it’s hard to let go of the notions of validation that I covet through an editor choosing to publish my work. I’ll never be able to release it completely because it’s a process that I have great respect for. But the entrepreneurial writer in me has been encouraged by MONA’s creative success. And it’s reminded me that there’s nothing intellectually or creatively ‘dirty’ in putting a business model around your own creative endeavours. Oh, and in a nice little twist for us as writers, there’s a library in MONA [Wilfredo Prieto's Untitled (White Library)] which looks and feels like any other library, except that all of the covers spines and pages of the books are blank, as are the pages of the newspapers sitting on the table. Make of it what you will. Life is peppered with turning points - those ‘ah-ha’ moments, or forks in the road. In my first post I wrote about a turning point I’d had at the Wheeler Centre last year. It was when I finally realised that the traditional publishing models were floundering, and that I would need to find new ways to get my work to readers. I had sat amongst the crowd with my focus on the speakers – stalwarts from the old publishing institutions. I looked to them for direction. Now I wonder if I was looking the wrong way. Should I have been looking at the crowd instead? Crowd-funding is what its name implies. Anyone can make a pledge (from a few dollars upwards) towards a project they’re interested in. Just about anything can constitute a project. Most of us are aware that Barak Obama used crowd funding to help fund his 2008 US presidential campaign. Some of us have performer-friends who have used crowd-funding to finance performances and CDs. It wasn’t until I saw a presentation by Kate Toon and Rick Chen at the Melbourne Emerging Writers’ Festival that I realised writers could use crowd-funding too. Duh! In trying to find markets for my article I had looked at community-funded reporting like spot.us and youcommnews.com (which are essentially crowd-funding initiatives). But though established writers have had success with this, I questioned the viability of Communit-funded reporting for an emerging writer. The stakes are high (often tens of thousands of dollars). Who would pledge that kind of money to an emerging writer? Yet asking for a smaller amount through a general crowd-funding site is an idea that has legs. Toon used crowd-funding to raise money for her book of poetry, ‘Gone Dotty’. Elmo Keep successfully funded a spot on a Kiss cruise. New Matilda stayed afloat with the help of crowd-funding. More recently a campaign was undertaken to fund an online magazine-to-be matter.com that will focus on long form journalism (Crowd-funding and long form journalism = double points for this post!). Also check out www.crowdfunding.org to help get your head around it (including this video about crowd sourcing). For now I’m going to be staring at strangers wondering what non-fiction topics they might like to fund. Meanwhile, have you had any experience with crowd-funding your long form non-fiction projects?